Why we are always pleased to leave the US. We enjoy meeting our friends, the leaf peeping and buying some hard to get items, but…. 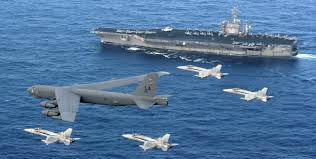 Most news programs obsess about military matters in places where the US has no business to interfere. i.e. the Mid East, Afghanistan and the waters around China. Some of this is couched as unconfirmed threats from Russia and China. The Russians and Chinese are surrounded by US bases and fleets, but that is somehow different. This is why most people in the world see the US as the biggest threat to world peace. Next, comes the violence by police and crime within the US. Incredibly, the head of the FBI is complaining that because folk are filming cops being bad, crime is increasing. So obviously cops should be free to be as bad as they like. Lastly, come the crass sayings of this candidate or that, all of whom are corrupt and in the pay of billionaires. We will be glad to go home.